With an affordable $747 price tag, the new Nikon 24mm f/1.8G is a viable option for enthusiasts and professionals alike who are after a wide-angle for high-quality architecture or landscape work. Although intended for use on the Nikon FX-format DSLR, the new lens remains compatible with DX-format DSLRs, where it offers an equivalent 36mm focal length, as well as with many Nikon film cameras. 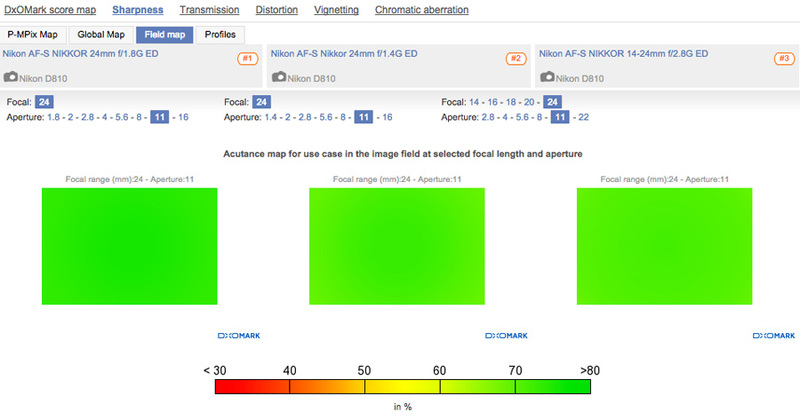 Features include Nikon’s AF-S & Silent Wave autofocus Motor (SWM), Extra-Low Dispersion (ED) elements for reduced chromatic aberration, Nano Crystal lens coatings for reduced flare, and aspherical elements for improved sharpness. 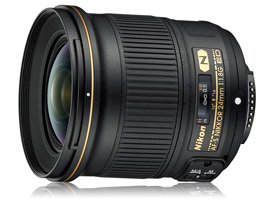 The new Nikon 24mm f/1.8G sits alongside the more expensive $1997 Nikon 24mm f/1.4 version in the Nikkor line up. Although both offer similar features, the f/1.4 version allows for an extra stop of light transmission while still boasting the same minimum f/16 aperture as the 24mm f/1.8G at f/16. We’ll be comparing the performance of these two Nikon 24mm primes later in this review. 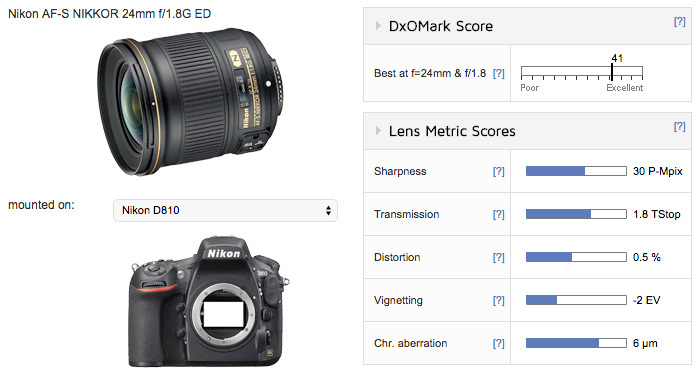 Tested on a Nikon D810, the new Nikon 24mm f/1.8G achieves an outstanding overall DxOMark score of 41 points. 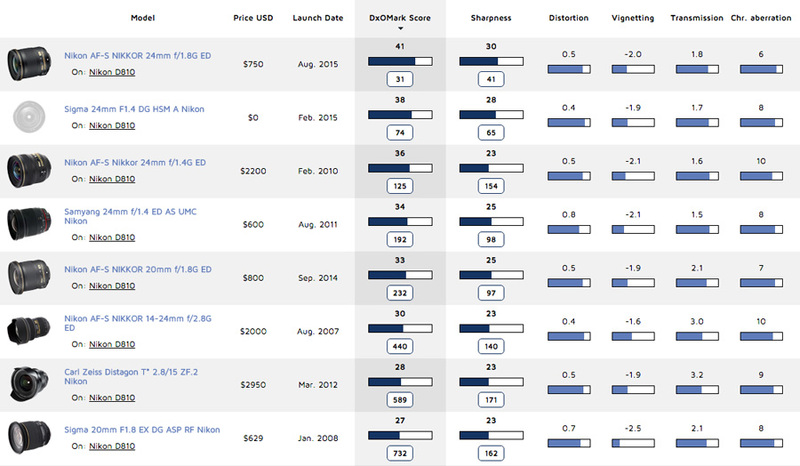 That puts it into the top ten (8th place, in fact) for all lenses tested on the D810, which is pretty impressive for a wide-angle optic. 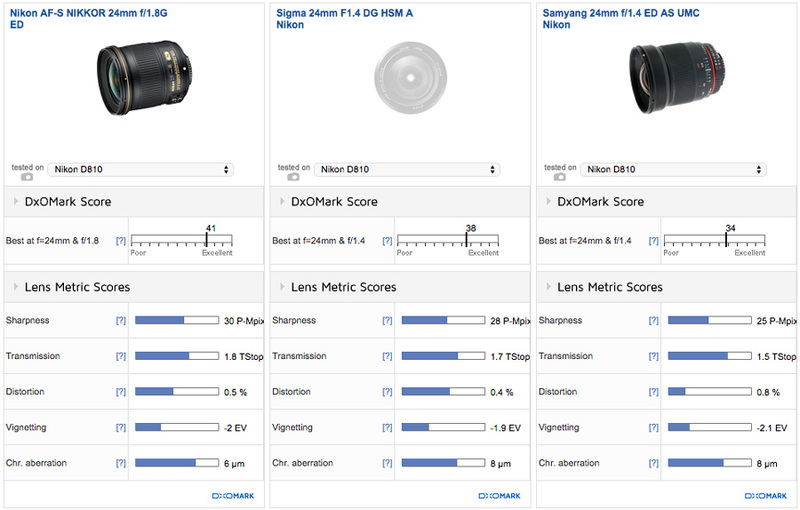 Counting all lenses up to 35mm, the Nikon 24mm f/1.8G ranks in second place, only a single point behind the Sigma 35mm f/1.4 with 42 points. 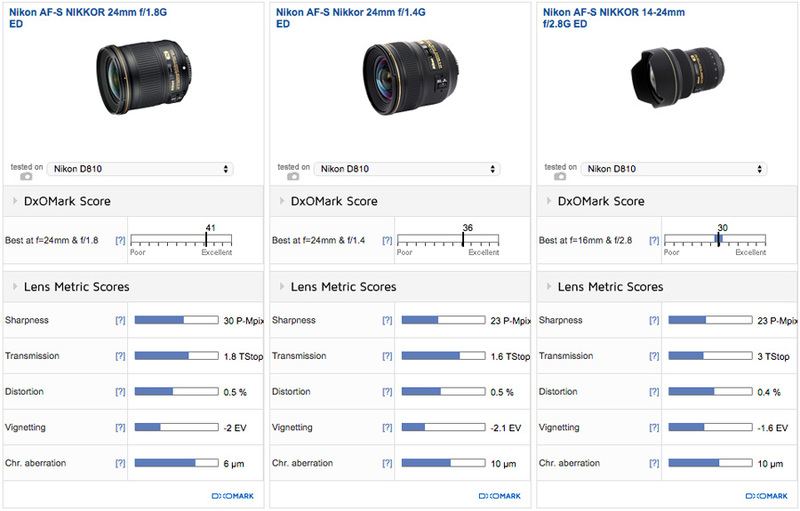 For the type of 15mm to 24mm wide-angle lenses preferred for much landscape or architecture work, however, the new Nikon 24mm f/1.8G is out on top, achieving the best sharpness and chromatic aberration scores, with other lens metrics comparable to its wide-angle rivals. 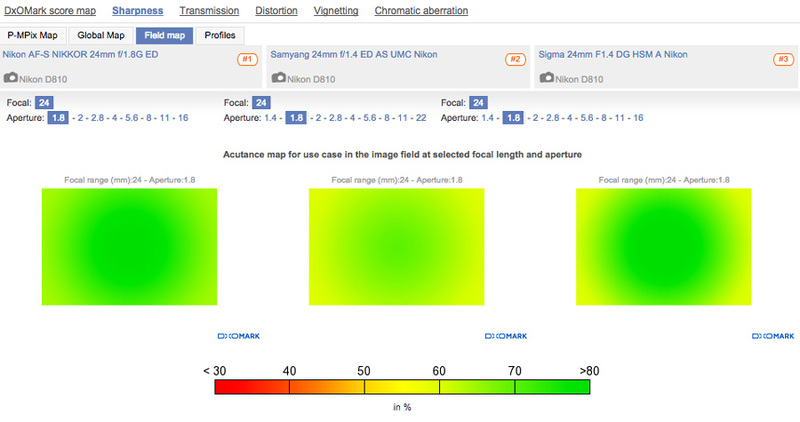 In terms of sharpness, we recorded excellent resolution between apertures f/2.8 and f/11, while performance at its widest f/1.8 setting is still good and particularly strong in the center, with slight softness in the outer field. 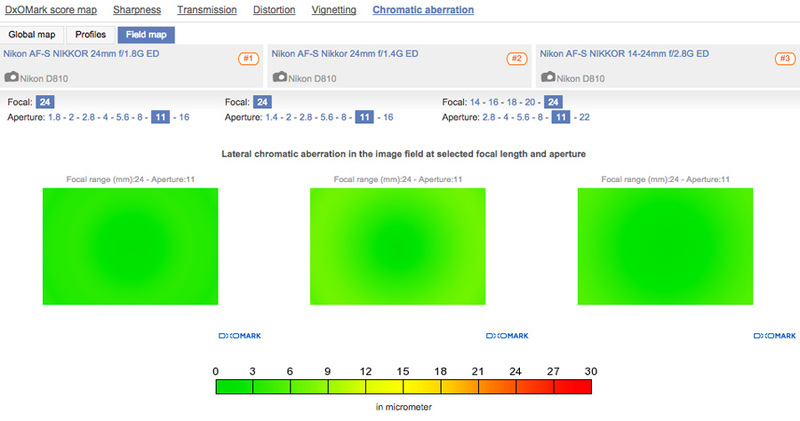 Lateral chromatic aberration is well-controlled at all aperture settings, too, including shooting wide-open. As you’d expect from a wide-angle lens, there’s noticeable vignetting at the maximum f/1.8 aperture, which will require some correction in post processing, but the effect is better controlled between f/4 and f/16. Head-to-head against the manual-focus $499 Samyang 24mm f/1.4 and $849 Sigma 24mm f/1.4, the new Nikon 24mm f/1.8G offers the best sharpness and chromatic aberration scores, and similar other lens metrics. If you need a wide-angle prime for low-light photography, the extra stop of light that the Samyang and Sigma allow will appeal, but the Nikon is clearly sharper at all aperture settings between f/1.8 – f/16. With a narrower maximum aperture, the Nikon 24mm f/1.8G also has a slighter weaker transmission figure, but not by much, and the Nikon 24mm f/1.8G actually maximizes its maximum aperture transmission compared to its f/1.4 rivals that lose a little light. Distortion is comparable to the Sigma 24mm and an improvement over the Samyang equivalent, too, with only minor barrel distortion evident; all three lenses have vignetting around 2 stops using the widest aperture. Up against other current Nikkor G-type wide-angle options in the shape of the $1997 Nikon 24mm f/1.4G and the $1897 Nikon 14-24mm f/2.8G zoom, the 24mm f/1.8G again comes out on top for sharpness and chromatic aberration. At f/2, the f/1.8G version is slightly sharper in the center of the frame compared to the f/1.4G version, with both having similar resolution in the corners at this setting. 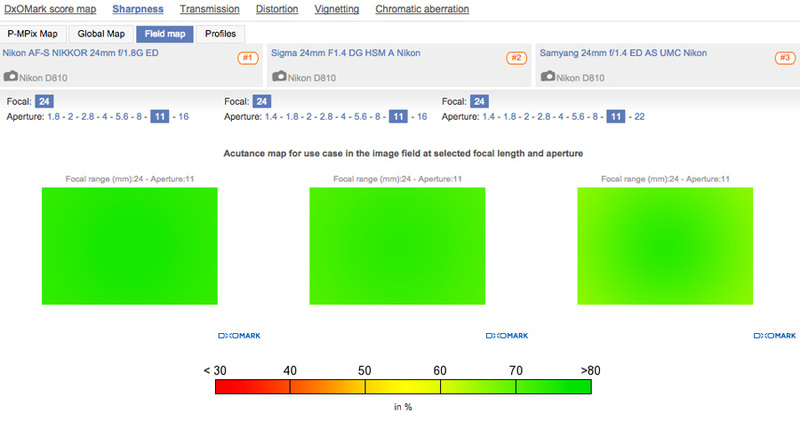 At f/2.8, both primes are far sharper and more homogenous than the wide-angle zoom at 24mm. 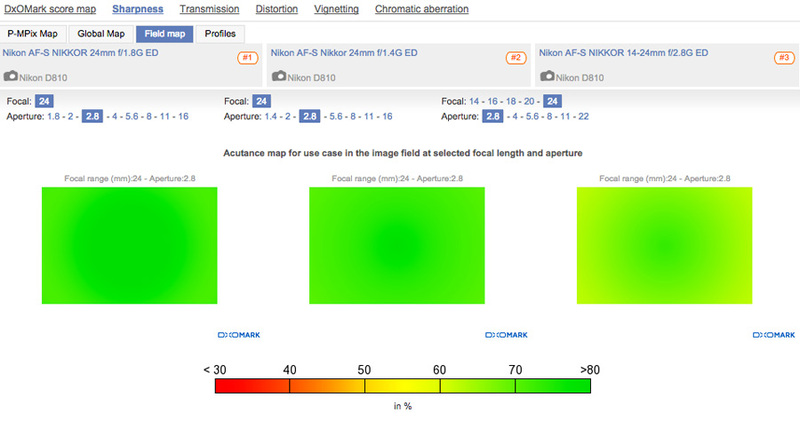 While all three Nikkor lenses are homogenous at f/11, the 24mm f/1.8G is the sharpest overall. Finally, Nikon has obviously paid particular attention to lateral chromatic aberration on the f/1.8G version, which is improved at all aperture settings compared to the f/1.4G version. For Nikon shooters after a top-end wide-angle lens for high-quality architecture, landscape, and interior shots, or just to fit a bit more in the frame, there’s everything to like about the new Nikon 24mm f/1.8G. Affordable and outstanding optically, it’s in the top ten for all lenses tested on the D810, as well as being the sharpest 24mm wide-angle tested to date on this camera. 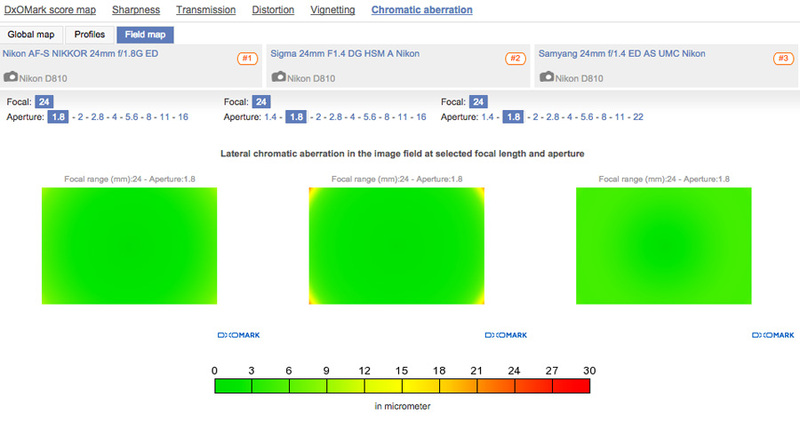 Not only that, it boasts better chromatic aberration results and similar other lens metric scores when compared to the 24mm f/1.4 competition from Sigma and Samyang. If you need the f/1.4 maximum aperture for low-light work, the Sigma 24mm f/1.4 is a better value than Nikon’s own-brand 24mm f/1.4G option, but both are surpassed optically by the brilliant Nikon 24mm f/1.8G.